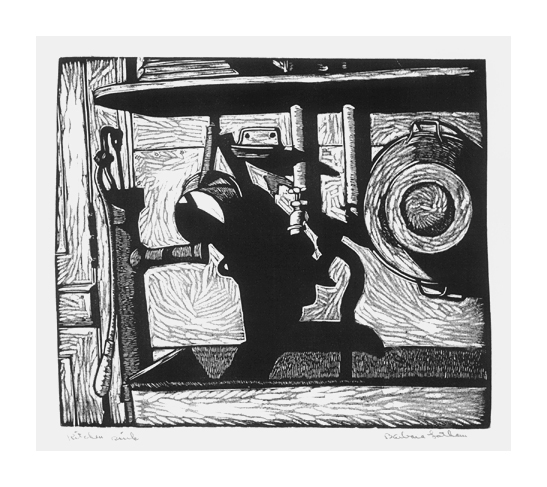 The Kitchen Sink (The Old Sink) - -c.1927, Wood Engraving. Edition not stated. Signed and titled in pencil. Annotated S. Brush Imp. in the printer's hand. Image size: 6 1/8 x 7 1/4 inches (156 x 184 mm); sheet size 9 x 9 5/8 inches (229 x 244 mm). A fine black impression, on off-white laid Japan, with full margins (1/2 to 5/8 inch), in excellent condition. 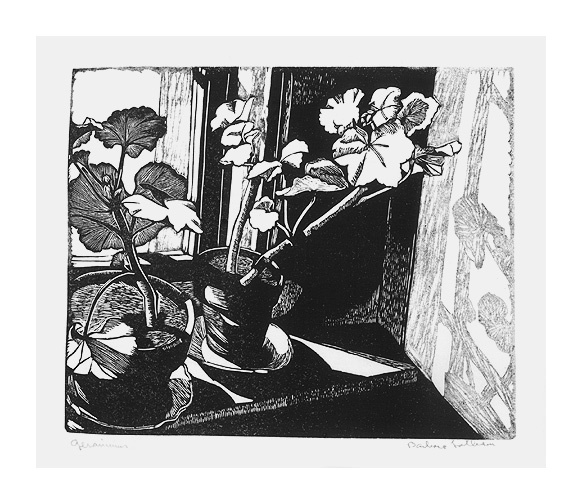 Geraniums - -c.1930, Wood Engraving. Image size: 6 x 7 1/4 inches (152 x 184 mm); sheet size 6 7/8 x 9 inches (302 x 229 mm). A fine, black impression, on off-white laid Japan, with full margins (1/2 to 1 inch), in excellent condition. 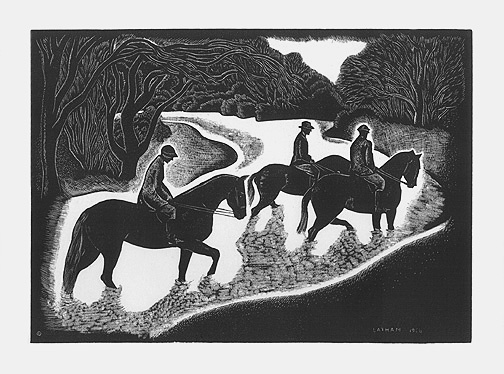 Fording the Stream - -1936, Wood Engraving. Edition not stated. Signed and dated in the block, lower right. Image size: 6 x 8 1/2 inches (152 x 216 mm); sheet size 13 1/2 x 18 inches (343 x 457 mm). A fine, black impression, on cream laid paper, with full margins (2 3/4 to 4 3/4 inches), in excellent condition. In the original American Artists Group mat. 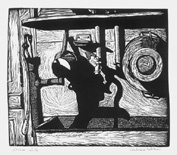 Published by the American Artists Group in an unsigned, unlimited edition, not exceeding 200. 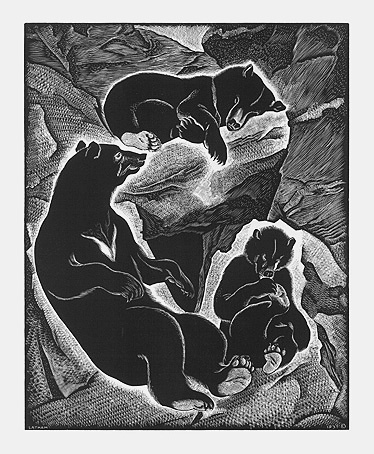 Bear Family - -1937, Wood Engraving. Edition not stated. Signed in the block, lower left. Dated in the block, lower right. Image size: 10 x 8 inches (254 x 203 mm); sheet size 13 x 18 inches (330 x 457 mm). 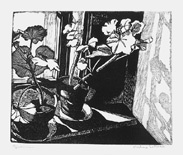 A fine, black impression, on cream wove paper, with full margins (2 1/2 to 4 3/4 inches), in excellent condition.